We recently discussed the top social media trends that we are likely to see in 2017, many of which apply to organizations that have been active on social media for some time. Still, we field questions all the time from lawyers and law firms about whether social media should be a part of their marketing plan. During a recent legal marketing webinar hosted by MyCase, I addressed the basics of digital marketing for lawyers. Here are links to a full recording of Digital Marketing for Law Firms along with a MyCase recap of the webinar on their blog. This program discussed the reasons why lawyers should be engaging on social media, in blogging and what types of content draw the most attention. 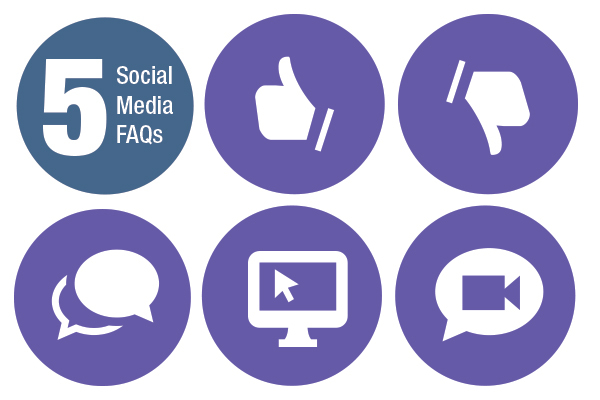 Here are answers to some of the most common legal marketing questions that came up. Should companies that have various office locations make separate profiles for those locations, particularly on Facebook? For companies such as franchises, the answer to this question is yes, and there is a framework in Facebook that allows users to do that. There is a Facebook discussion on the issue at Can you set up multiple locations for a business’ Facebook page? For law firms, however, I do not recommend setting up separate social media profiles for each office location. The bottom line is that it dilutes the firm’s brand, increases marketing costs unnecessarily and decreases marketing productivity, thus diminishing the return on investment in marketing. How often do you recommend lawyers update social media? Social media is just that, “social.” Pick one platform to start with and make sure it’s the one that is used by the majority of your clients and referral sources. Remember, people do business with those they know, like and trust. Then spend 10 to 15 minutes each day updating your profile, connecting with people and sharing relevant information. That’s it. If I’m posting on LinkedIn, do I really need my own blog? If you are publishing on LinkedIn Pulse already and you are sharing that out, you do not necessarily need a separate blog. LinkedIn Pulse is essentially a blogging platform, but remember that it is not branded for your business nor does it have a URL that is unique to your practice area or location, which helps with search engine optimization. Is there an application that will allow you to post on Facebook and Twitter at the same time, for efficiency purposes? At Furia Rubel, we use Hootsuite for some clients and CoSchedule for others. There are many other apps that allow you to share on multiple sites and schedule your shares. Keep in mind, however, that when scheduling your social media shares, if something happens in the media, your posts can be easily misconstrued. For example, you don’t want to be advocating for Second Amendment Rights on the same day as a mass school shooting. What is a reasonable ‘investment’ in SEO? Recommended budget figures seem to vary widely. Search Engine Optimization (SEO) comes in many forms. “Organic” SEO is supported by creating and sharing content such as blogs, images, videos, and making website updates, distributing online press releases, garnering online media coverage, and just about everything we do at Furia Rubel for our clients. Organic SEO is a strategic byproduct of well-thought-out marketing and public relations initiatives. On the other hand, there is paid SEO services, which vary greatly from company to company, practice area to practice area, and region to region. A good place to start in determining your SEO budget is to read “How much should you spend on SEO services,” published on Search Engine Watch, which provides more technical and detailed information about search engine marketing.